Not that kind of zombie, Minty! Bad techie! There really are zombies on motorcycles in Resident Evil 5. I'm still on the fence as to whether they're dorky or cool. Judge for yourself. I've received messages from several readers that, when they viewed the KT LiveJournal, they received warnings from their Internet security programs about spyware and other nasty business. Rest assured, this was not a problem with my website or LiveJournal. Rather, it was because Photo Web Comics had been hijacked back in December, and links to the site were flagged as malicious. I went through this weekend and edited 56 LJ entries to remove these links. Hopefully, everyone's AV programs are happy now! A lot of people have started linking to KT, which is fantastic. Thank you! However, I've noticed a few people are hotlinking my banners instead of saving them to their own web space. I could install some files that would prevent this, but I'm a busy lady, so I'd rather just ask nicely. If you are linking to KT, please save the images to your own space. Thanks! I don't know if I would be amused or annoyed at a techie who answered the phone like that. I'm leaning toward the side of amused, because I think it would be a step up from talking to a Dell technician in India. She uses speakerphone (aloud where someone in the next cubicle could hear) rather than a headset? I notice because I used to work in a call center, lol. Yeah. You're not supposed to notice that! ;D I have a headset, but it doesn't fit the ponies very well. They'll upgrade someday. I haven't seen them, but zombies on motorcycles definitely sounds more dorky than cool. They're definitely not as cool as zombies with chainsaws. *cackles* I like the noogie solution. Go Minty! Little brothers should never be allowed near computers. There oughta be a law. Hee... I did think about Little Brother when I wrote this. Although Kris' little brother has had his fair share of, "I'm downloading music, downloading... oh crap, what's that?!" That's where NaNoMonkey sits? Weird! heyy! i have that little monkey. I love looking at all minty's office props. LOL! That's funny. :D I've seen that set of monkeys in two different sizes. The one I have there is only 2cm tall! 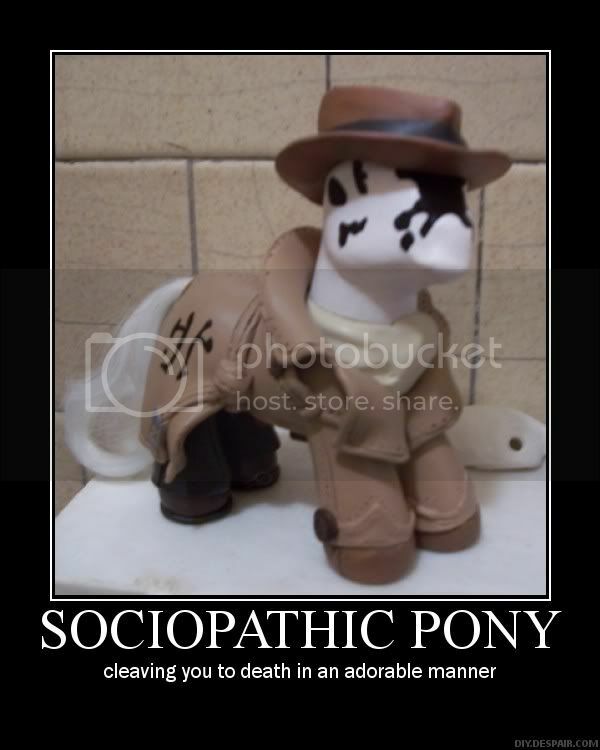 I bet that would be quite a challenge--making a pony giving another one a noogie! I imagine those hooves are quite painful! It is an actual playset for the BTVS action figures. ^_^ I frickin' hate Buffy, but it's a great set to use. Hmm, I'm not sure about the zombies on motorcycles... As if a zombie would know how to even drive one!! I think zombies with chainsaws would be cooler. And scarier! ok, saw this, and thought you might like it. check it out! they made mylittlepony's into famous movie characters. Sounds like my mom talking about my little sister's downloading habits when she was in high school XD. Also, I saw this and thought immediately of this comic. Had you seen it yet? Know it late to comment, but want to say that they're ready call Manji on RE5, they're effected by the las plasga parasite from RE4.